Every year, marketers want to know what’s hot in trade show exhibit design, so this blog will help you identify key trade show exhibit design trends that can help you make the most of your trade show commitment in 2019. Most of these design trends can be incorporated into a booth rental, booth update or a completely new and improved booth design for 2019. 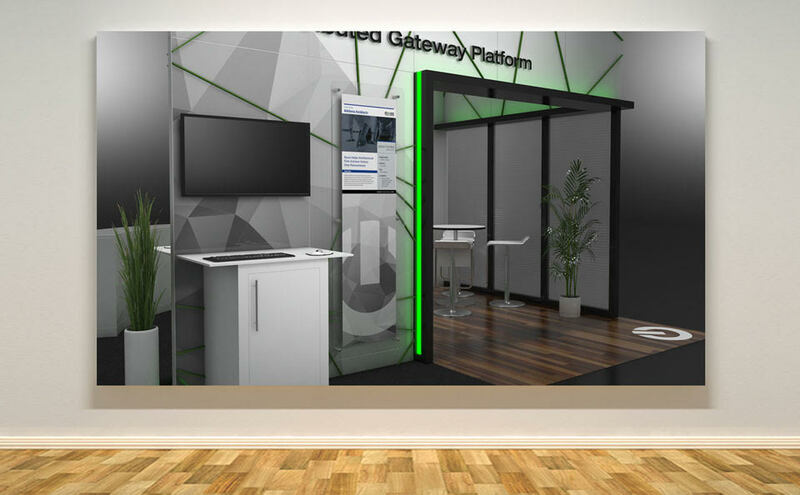 We usually see customers updating their entire booth every 2-3 years in order to stay current and make the most of their trade show experience. Many company “products” are not tangible hand-held items, so it’s even more critical to build in an experience for attendees. Provide a visual and tactile experience via demos, hands-on, or show how you are at the forefront of technology by incorporating new technologies like Virtual Reality, which allows attendees to immerse themselves into what your company has to offer. Incorporating experiential elements to encourage attendees to test and experience your product is crucial, and something to keep in mind as you create product demos or presentation areas – complete with space for people to sit and make themselves comfortable. As 3D printing is coming down in cost, this is an important tool in your trade show arsenal. The sky is the limit on developing cost effective custom graphics, textures and logo-treatments — used on fabrics, wall coverings, murals, textures, carpet, tiles, or vinyl. There’s no excuse in 2019 to not have a completely customized and branded trade show exhibit. It’s easy, affordable, and allows your company to stand out and make a statement on a busy trade show floor. Exhibitors are discovering that building “UP” has an advantage. Everyone stands to be the same on a trade show floor unless the signage or booth stands out from down the aisle or across the show floor. Think outside the box with your exhibit house to discover some creative ideas for your company to make a strong statement that takes advantage of space above your exhibit, whether it be with lighting, texture, hanging signage or digital technology display. Today’s newer exhibits offer some kind of private or semi-private meeting space. It’s one thing to demo a product at your booth, but where can you effectively entertain more serious conversations or even a potential partnership or sale? Incorporating a small but inviting area for sales to take the conversations one step further is taking off. Give your company an opportunity to close more business on site. Textiles are big. Natural design elements and texture are making their way into exhibits where it emphasizes and supports what the company does or its mission and values. Earthy tones and natural textures work for companies that support environmentalism, but also can work for companies catering to millennials, who often share these values. This year, digital technology is going to be huge. Products like LED tiles and screens will light up the show floor and bring attention to exhibits, giving them color, movement, and definite wow-factor. And for those exhibits that are taking advantage of all their available real estate, the higher sometimes the better to attract and retain audiences.